is it possible? could we do this? maybe we could RV it after tampa. or steve's last assignment (he has three left)...sort of a pre-sailing prep. or am i just crazy to even think of such a thing? of course, having middle or high schoolers at the time, things would be different than the families i'm currently following. i'd love to find an RV family, with older children. and it wouldn't be as exciting for us, as we wouldn't be able to travel all that much, with steve still being in the military and having to work, deploy, etc. but even with that said, my mind is churning and dreaming about the idea. these families are all amazing, strong and inspirational. and their lives fascinate me. i'm not sure i could purge as they are or have. rather, we will purge some, take some and plan to put some into storage. we're pretty minimalistic as it is; however, we do have things that we just can't let go of (or shall i say, i can't let go of). what happens if one of our kids is some star athlete or something in high school? will you still pull them out of school to go sailing? no, most likely not. if something like that happened, we would wait until they're out of high school. but for the moment, we talk about beginning our sailing adventure when ryder is 14 and sky is 15. kiele will be 21 and will have the choice, but for now, she has said that she wants to go with us. yesterday, kiele asked what she should do for her next big project in her gifted class. her project can be on anything; it just has to be some huge self-guided writing project. i suggested that she do her project on our future sailing adventures. we discussed plotting our sailing route and writing about each destination--the communities, their cultures and how we can give back to the people at each stop, as that is an essential part of our journey. and i'm excited that she's excited to take on the project. your kids are going to hate it; they're not going to want to be pulled out of high school, to go sailing with you. my reply is that we'll see when the time comes. i am well aware of football, soccer, cheerleading, homecoming, prom, friendships, etc. for now, a girl has to dream...dream about possibilities. even now, many people think that children would hate moving every two to three years, but i truly don't think mine do. they might not love it, but they don't hate it either. i'm constantly talking about how lucky we are to live in and experience the different locations, as we do. and how lucky we are to have special friends all across the US. i enjoy moving and i try to teach my kids to enjoy it too. the only challenge is kiele's education, but i think we're now to the point that her services are so engrained into her individual education plan, i don't think there's a school out there that could rightfully challenge them. for the moment, i will just continue following these incredible families living out of their RVs and dreaming about the possibility of my own family one day doing the same. if not out of an RV, definitely out of a sailboat. 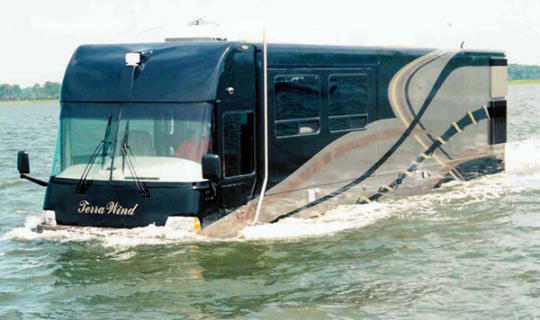 or maybe we could just get an amphibious RV ;-) if only it weren't a million dollars. crazy, huh?